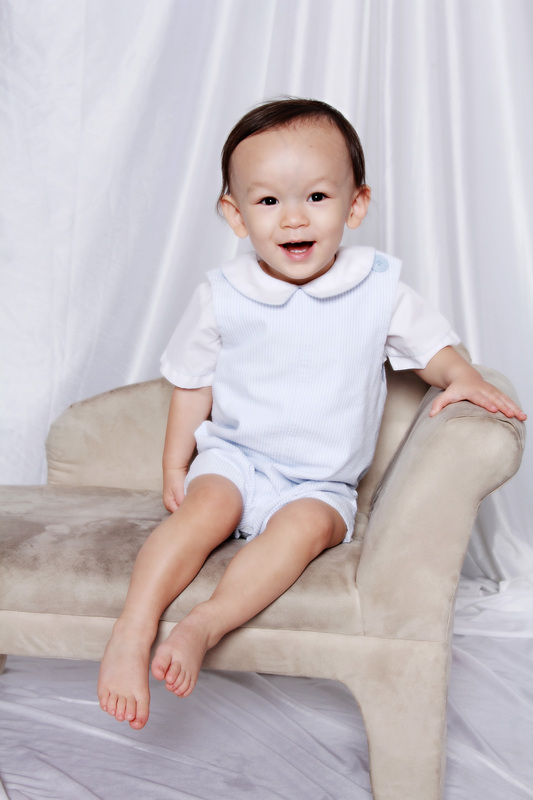 Not a lot of folks read this, but since YOU do, here’s a sneak peak of Bruce’s portrait session tonight. I know he’s probably THE most photographed baby on facebook and you’re sick of him, but every 6 months or so I like to see a professional. Lindsay taught Bruce to say, “Mama” on our way to Charlottesville on 3/20. He said it before we even made it to I-485. It was awesome. I just didn’t want to forget that. Now we’re working on “jiāyóu” and “Nai Nai” which are “add gas” and “grandmother” (Tom’s mom, because in Chinese there are different words for your father’s mother and your mother’s mother) respectively in Chinese. Bruce mimics almost everything that we do. Tom made the mistake of playing with his swords and weapons in front of my precious baby. So now when we come home from grocery stopping, are unloading the car, and I’m all, “you’re a big boy now, you can walk into the house by yourself,” Bruce does not pass Go, does not collect $200, he just goes directly to SWORDS. This past weekend I realized that he can take my phone, turn on music and start dancing before I know it’s not on me. He also likes to walk around the house and pretend he’s talking on it. He still loves the Wake Up with Donald app. And when he’s getting cranky in the car, playing the 2012 “Les Miserables” soundtrack heals the world. It has for pretty much his entire life. Nowadays “Let It Go” is his jam (had nothing to do with that, I promise), and he loves a Little Caesar’s commercial with a bunch of Hispanic (?) guys singing, “Bite, bite. Sip, sip. That’s what makes a combo!” It came on the tv in a restaurant this afternoon with no sound and he was STILL dancing and giggling. It’s a lot. You don’t have to read it. Wow. 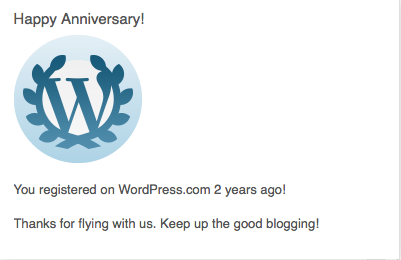 Two years. Where was I 2 years ago? I think I was on the verge of, “omgomgomgomg” and “is this really happening? !” Could it be possible? Three years of disappointment. One more missed period. I peed on the thing and then, “omgomgomgomgomgomg.” This time it was real. I had no idea how awesome Bruce would be, or even that he would be Bruce. Crazy. Amazing. Today, Bruce went downstairs around 1 for lunch. I gave him a slice of bread. Not interested. I opened a banana. He ate about half. (I finished it, although I hate bananas.) I baked him a frozen pizza. No dice. I made myself a microwave Evol All-Natural Vegetarian Truffle Parmesan Mac n’ Cheese and a spinach/pineapple/berry smoothie. THAT’S what he wanted. It makes me swell with pride to see him make those choices. He’s not averse to chicken nuggets, but he’d rather eat the fruit cup in his Chickfila kids’ meal. Tom and I are leaning away from animal products. (We’re not vegan, or even vegetarian, but I can’t unlearn the things I’ve learned about how bad all that stuff is for you in the long run.) It’s neat to see our sweet, healthy boy get excited about a spinach Nutriblast. Bruce is getting so big! And he’s so funny! I wish he was talking, but I feel like he does understand most of what I say. He has a huge bruise on his forehead. 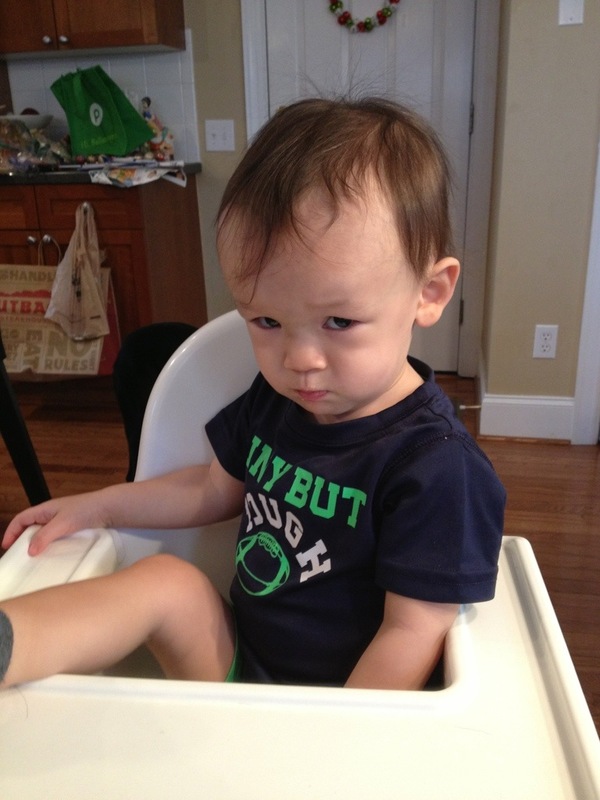 When I went in his room to wake him up (about a week ago), I pointed to my own forehead and said, “what’s this? What happened to my baby?” He put his hands on the railing of his crib and smashed his head into the bar. Funny fella’. Today, I put the sleep sack on him (because he cannot be trusted to stay in his crib at naptime) and put him in the crib and he fussed. Then, I put a pillow (I know, Mother of the Year Award) in the crib and laid his head on the pillow. 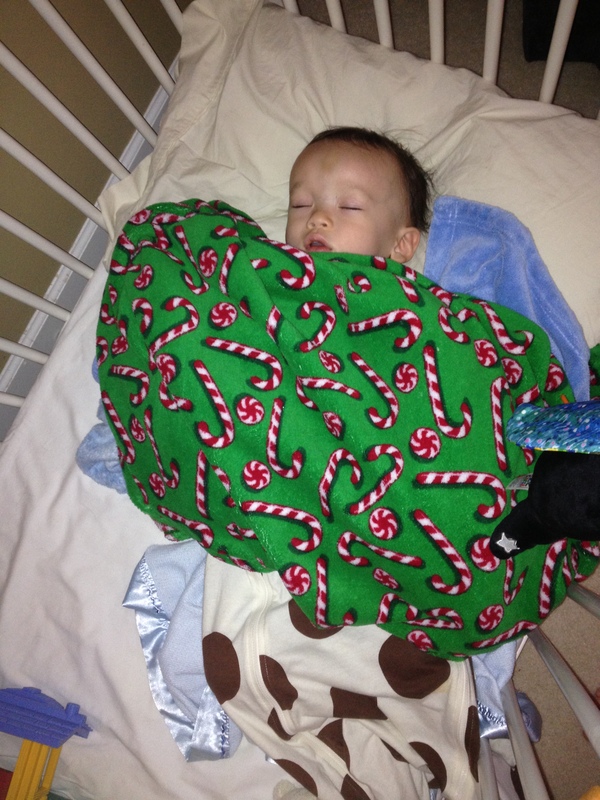 He put his middle and ring fingers in his mouth, grabbed his blankie and DID NOT BLINK. But shortly after I left the room (No crying! Woo hoo!) I imagine he did close his eyes. Still closed now, just checked. Big boy sleeping on a pillow. Ya’ know, if you stumble on something at Goodwill, like, a $10 American Girl doll in like-new condition, or a similar hidden treasure, and you know that I’ll love it, I don’t see any fault with wrapping it up and giving it to me as a gift. Actually, Haley and I were with my cousins when we found American Girls’ Felicity and Kaya. We couldn’t leave them. It makes sense. I love my AG Samantha. (Actually, she dates back to Pleasant Company.) I’m a collector. A psychology student that I had to go see at AIW (As part of my psychology class, we had to go. I’m crazy, but that’s not why I went, I went for the grade.) gave me a Mickey Mouse beer stein and it’s prominently displayed on a shelf in my living room. I forget where she found it. Maybe she just had it forever, she might have said yard sale. I forget, but I love it. I love that she thought of me. It’s such a rare, unique, and special thing. I’ve never seen another one like it. It’s slightly alarming that the need exists for this post. Maybe there is no need for a post. Do people do this, or is one person just doing it to me? Maybe the need is for a note to the individual… but, okay, you tell me how to broach that subject. Rather than continue harping on why it’s in relatively poor taste to gift someone used articles of clothing, I will instead point out several options for super-cheap or easily made gifts. I get it if you’re broke. I get it. Your life’s not about making money, you’re a do-gooder. You want to make a difference. I get it. Check ebay. For example, I searched “Disney.” Then arranged the results according to price + shipping, lowest first. I immediately found a Walt Disney 6 cent stamp for $ .99 shipped. Buy a mini-frame. You know, they often use them for place settings at weddings? (I think I actually have TWO of those laying around my house, if you don’t, they’re like $1.) Cut a piece of acid-free paper to fit the frame and mount the stamp to it. Boom. Nice, sweet, thoughful… $2. (Unless you’ve been to a wedding in the past 5 years, then it’s only $ .99!) The same price as a shirt at Goodwill that was somebody’s throwaway. I love it. I’ll sit it on my mantle or desk. Super cute. Crafty. Thoughtful. I appreciate you. Your recipient doesn’t have a Kindle? Do they have a Smartphone? Do they have a computer? It’s 2013. You can’t dance around this technology issue. I sent my sister a $10 Starbucks gift card on her birthday that I got for free by signing up for a Starbucks account or some crap. $10! That’s at least two tall white-chocolate mochas. I know she’ll like that. It cost me nothing. Still evasive about the recipient having or not having technology, huh? That’s okay. If you’re reading this, you can find things. Make me a cake. Just the fact that you mixed, and baked, and decorated, I mean — that takes me all day. Make me a mix CD. There’s thought in that. Did you know if you draw on a plain ceramic mug with a Sharpe and then bake it you will heat-set it? Yeah. Custom mugs anyone? Cut out a little heart on cardboard, trace that heart onto a map, cut out that map and Modpodge it to the cardboard, put a ribbon on it, boom: sentimental ornament that will recall that trip we took that one time. (“I’ll put that flea in a box…”) Do the same thing with a bunch of Disney characters from a book that you found at, oh, I don’t know, Goodwill? You could make a whole set: Snow White and all seven dwarfs. Me. Me. Me. “That’s fine,” you say, “for you. Bruce has no desire for a $ .65 octopus necklace!” Learn something. 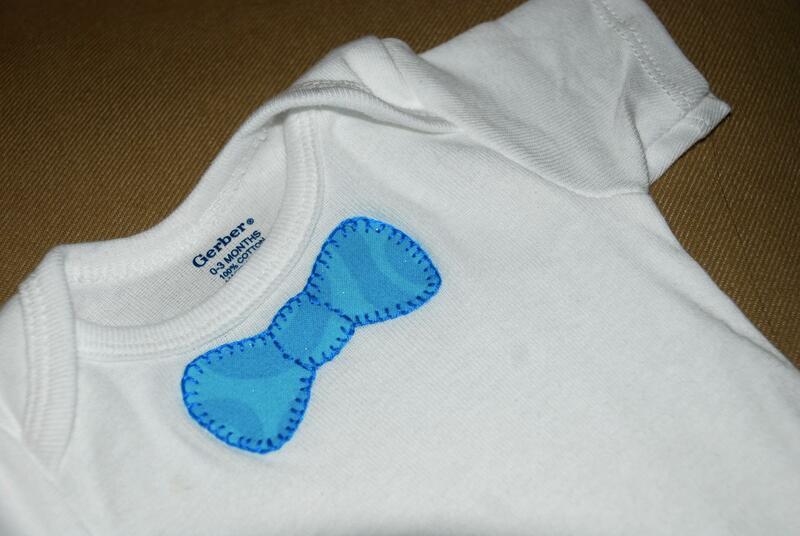 Google “blanket stitch,” and design a t-shirt using a fabric remnant. It’s painstakingly custom-made by hand! That’s valuable! I’ll keep that forever! You don’t have to do this big thing. Just a little token, a little gesture, is sufficient. And let’s face it, a shirt that’s been caressing someone else’s stinky pits or a sleeper that some other baby pooped in is no big thing anyway. I’d like to research the History of a Gift in modern times. Specifically, I want to know how we got to this point. When we were kids, anything was okay. “Look, I drew this for you.” That’s pretty neat, you did that by hand. You put yourself into it. I guess we got older and started making our own disposable income and wanted to do more, which evolved into making money, albeit never enough, and having bills, feeling obligated to buy presents. We can go back to the drawings. What did I do to make you think, “okay, I have to get her a shirt,” or, worse yet, a skirt and a pair of pants. Not a SHIRT and pants, a skirt, a bottom, and pants, another bottom. What woman buys another woman a pair of pants?! Pajamas are the exception. But one doesn’t just gift a pair of pajama bottoms. It’s so… ugh… I just have run out of words to describe how I feel smiling as I open something that perhaps someone else opened once upon a time. You know how re-gifting is tacky? You’ve heard that, right? This is like re-gifting, except worse. We can assume a re-gift is something new that you don’t like so you don’t use it and instead you gift it to someone else, in the same new gift condition in which it was received. This is kind of like that, except someone else didn’t like/want/need this so much that they gave it away. It was a little bit nicer than trash, so they didn’t want to throw it away completely, but they really can’t have it in their house anymore. And now it’s in mine. A weird thing happened yesterday while I was singing in the shower. Well wait, let me back up a bit. When I got pregnant, my nose became very swollen and my voice got real deep. I did a little research and tried to mention it to Dr. Wolanski. This article describes my symptoms exactly and is what I believe that I had. It’s all over my head, but, as the article mentions, once Bruce came into the world, the symptoms began to subside. Fast-forward to present day. My voice never did fully recover from pregnancy. I can’t tell you how disheartening that has been. I miss singing with the Disney Princesses. I look at Bruce and just think, “well, I guess my new Gaston voice was worth it.” I have always had pretty severe symptoms of what I believe is undiagnosed PCOS: facial hair, abnormal cycles, acne. I’m 30, why do I still have acne? I had even felt similar pain to that which I encountered that fateful Black Friday in 2011, but much less severe. We were at Disney World in 2003. I just could not get the crampiness to go away and was uncomfortable in every position. In hindsight, I was playing with fire and should have gone to see a doctor. Tom and I have taken a whole-body approach to health. Maybe I could take a hormone to combat what I assume is high levels of testosterone that are producing many of these symptoms. Or! Maybe I could feed my body a diet of living, healthy, leafy deep green vegetables. Maybe I can shrink the fat cells that (I assume) are producing some of the excess hormones that are doing this to me. I believe Coca-Cola fed Mr. Nasty. (You know, like the way Hexxus feeds on toxins and poisons in “Ferngully.”) I believe my body wants to heal itself. I believe my cells are slowly becoming more alive as I embrace the food that God gave us. While I was in the shower yesterday, I got a little frog in my throat while I was singing (badly). I couldn’t seem to clear it. I just kept singing (badly). It felt different. It sounded different. Hmm, I wondered… I tried an oldie but a goodie and suddenly I was singing (badly) along with songs that I haven’t been able to sing (at all) for a couple of years. I may not know what I’m talking about, but I’m going to pretend that the amount of weight I’ve lost so far is already affecting me in positive ways. I’m just going to assume this whole thing is slowly but surely beginning to impact my health. I’m so excited about this that I’m downright giddy. Pictures are great, and we take a picture of Bruce on Gaston’s chair each time. But you know, pictures are hard to display in large quantities. It’ll be tough to have something cute but unfinished or not full. Not to mention, at any moment Disney could pull Gaston’s chair. It may be a while, but they could decide to refurbish Gaston’s Tavern anytime. What happens when we have 38 pictures of him in one spot then the spot disappears? Plus, we don’t make it to Magic Kingdom, or any one spot, every trip. 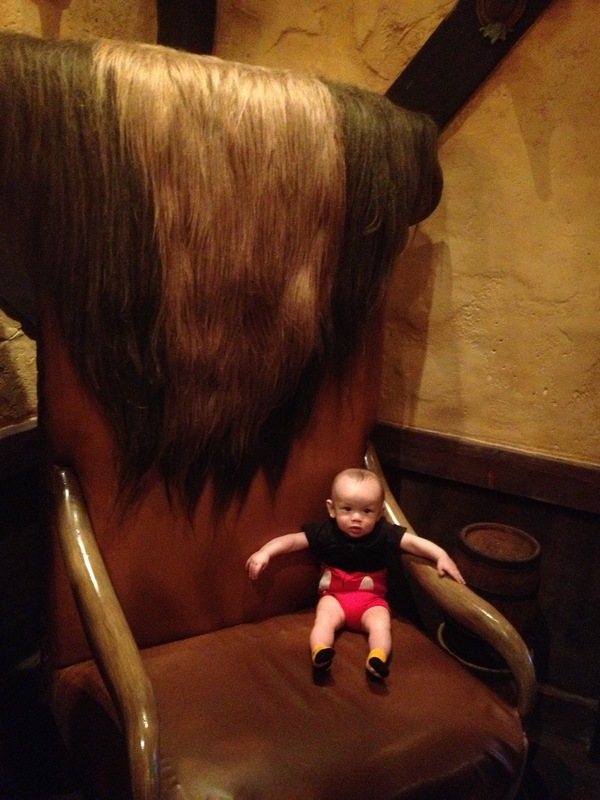 At any rate, here’s a shameless picture of the most adorable kid in the village sitting in Gaston’s chair. Awwww. So, I need something that will never be inaccessible. I need something that will be as cute on his first trip as it is on his 50th trip. Whatever it is, one has to look as good as one hundred. I started looking at creative guest books. I kept coming back to a tree with thumbprint leaves. How can I Disnify this idea? Pretty self-explanatory. I drew Carl and Ellie’s house. We add a balloon for each trip as soon as we get back, using Bruce’s fingerprint. Whether the trip is 1 day or 10, it gets one balloon. It’s been sitting on my desk in pieces since December, but last night I decided that I’m tired of having so many projects up in the air (HAAAAAA, no pun intended). 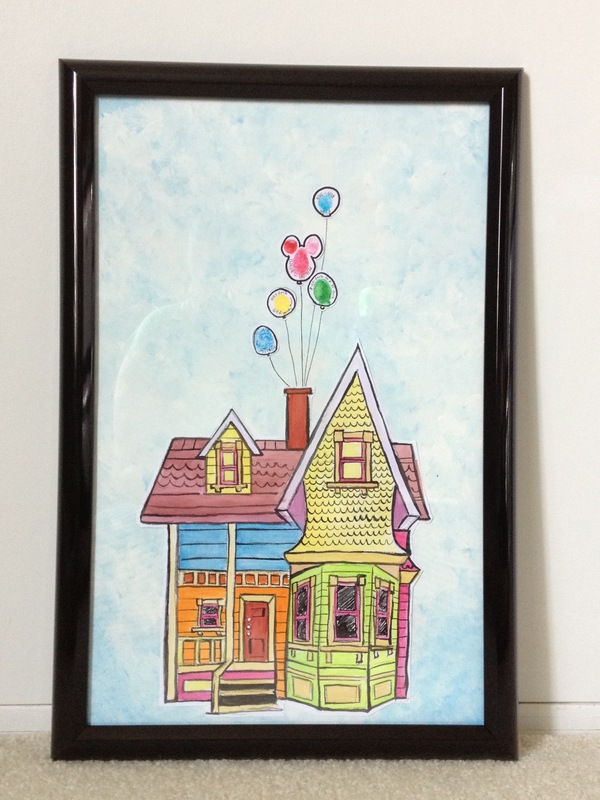 I bought a frame and painted the background. 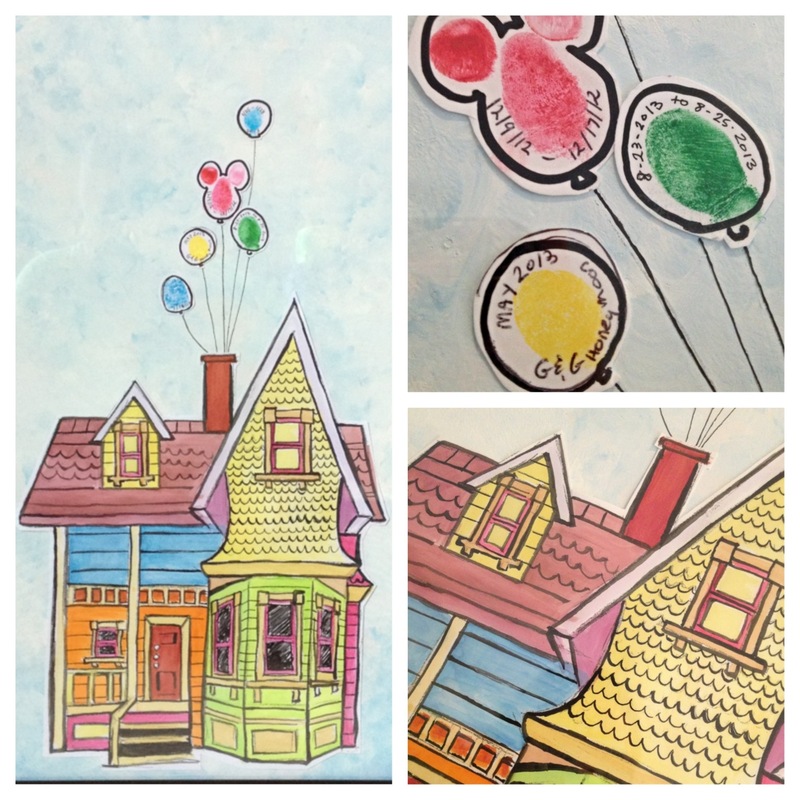 The balloons and house are gingerly glued to the background so that if I do run out of space, eventually, I can pull it all apart and glue it onto a new bigger background. I am so ecstatic! It’s so cute! We just got back from Disney this morning at 3:02 am. We were shooting for 2:30, and were making perfect time but had to stop to give Bruce a banana. Would you believe that added a half hour to our trip? I drove about half way, which was, like, a miracle because I never drive anymore. It was nice, though. I think Tom and I both managed to come home more rested than last time. Bruce was fussing a while ago, and I couldn’t figure out what his beef was. 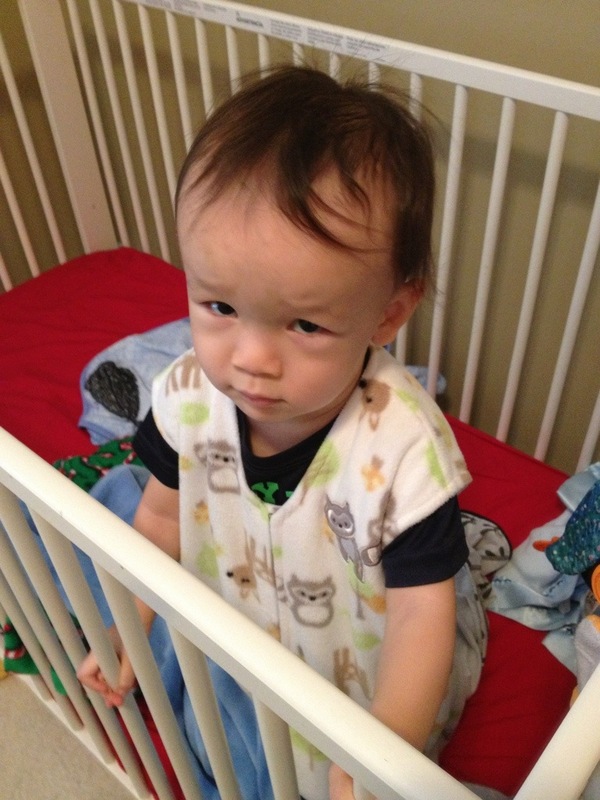 He didn’t want the cheesy grits that I was force-feeding him, and he had just woken up and was wearing a fresh diaper. I put him in bed out of sheer frustration. He cried. I brought him a bottle. He was calm, and now he’s out. So, I guess we’re all pretty tired after our long trip. Dude’s only been out of bed for like an hour and a half today. On Friday, Tom, Bruce and I went to Hollywood Studios. It wasn’t crowded, but boy was I cranky. I don’t know what the problem was. I even told myself not to ruin my own day. It didn’t work. I found every little thing, every individual that crossed my path, to be irritating. We went to Playhouse Disney. Walked up at 4:12. Show started at 4:10, doors were shut. We had to wait until 5. Usually there’s a line outside all day. So, I was surprised that they weren’t at capacity with a line for the next show. We came back a few minutes before 5 and got in line. We found a spot on the carpet in what would be considered the second row. I told Tom he was leaving too much space between him and the people in front of him, but he wanted Bruce to be able to jump around without hitting anyone. Admirable, but he left too much space. One minute to showtime, two snot-nosed brats got all up in our space, blowin’ up our spot. No parents. Just a 6 and 8 year old. An obnoxious 6 and 8 year old. P.S. Playhouse Disney is for preschoolers. It’s my fault. No. It’s Tom’s fault. I told Tom. I was SO MAD. In Voyage of the Little Mermaid, the people behind us wanted to talk, in Spanish, through the whole show. Uhm… we went to eat at 5:35 and the place we wanted to go (because they had veggie sandwiches) closed at 5:30. Tom bought me a drink, which did nothing to bring me back to earth. We went on the Backlot Tour. That was actually really nice. After the pre-show, they have a restroom so we stopped and changed Bruce. The changing table is situated in such a way that, although there’s not really any privacy to keep the general public from seeing Bruce’s man-parts, Tom could attend him from the mens’ room, while I helped from the ladies’ side. It was pretty fun. It put us in the back of the line. (Ugh, the line. Everyone was looking at us like we were criminals because we brought the stroller through the line because THEY’RE stupid and don’t know that you CAN bring a stroller on the Backlot Tour.) When we got to the vehicles, the cast member directed us to a lane, and then said I’ll do ya’ one better. He put us alone in the back row so we could prop the stroller up in front of us. #WINNING! I felt like I was sticking it to all the dumb f*cks who were eyeballing me in line. They all had to wait for us to get on. They all had to sit there next to each other all stinky and sweaty and wait while we mounted the back, our own private car. We went to Fantasmic and got there about an hour early. I never do that, but we’d done everything that we could with Bruce, so I figured why not at least go where we can sit down. There was a huge line, and an even longer line for Fastpass+ and the Dinner Package. It was insane. We were all the way on the far side of the amphitheater. It was very discouraging, although Lindsay said when she was there with the Gonsalveses last week, it was practically empty at the second show. That made me feel better. There was only one show Friday night. It was a good day, that was the only place that we encountered any kind of line or crowd. The family of four in front of us each had their own camera and decided to all take flash pictures of the entire show. I don’t know why they kept trying. Their pictures were sh*t. I know. I saw them light up on the review screen every single time. Just a railing hit with the flash, and a foggy white blur of fountains or fireworks in the background. I just watched the show. Didn’t take a single picture. It was nice. The Beauty and the Beast float was missing from the Princess Medley. And it broke my heart to hear some kid say, “who’re those people?” when the Indians came out in their canoes. Friday night we stayed at the Maingate Lakeside Resort. Our go-to off-property place. We found a Winn-Dixie and bought a rotisserie chicken, crackers, and cheese, as well as cheap fruit and made spinach/kale/fruit smoothies in the room. Bruce had a horrible night. He woke up over and over and over until we put him in bed with us in the wee hours of the morning. He was very, very tired on Saturday. We managed to make it out of our room right at check out time, 11 am, I believe. We headed over to Port Orleans to check-in. Usually I sit in the car and let Tom do the leg work, but I wanted to see the lobby. It was really nice. We had requested a high room, but they were able to put us on the first floor immediately if we didn’t want to wait. In hindsight, it worked out to our advantage. It was a parking lot view, but easy, easy, EASY access to the truck. We parked right in front of our room, 9608. We’d stayed at French Quarter before, but this was our first time at P.O. Riverside. If I was going to pick, I’d have probably gone with FQ again, but since it was only for one night, I thought I’d splurge on a Royal Room. I’ve always wanted to stay in a Royal Room. The idea is that this is the place where Tiana’s princess friends all stay when they visit, and the room is littered with personal touches from each princess. OH MY GOD IT WAS AMAZING. My whole cranky-pants mood turned completely around at the door to our Royal Guest Room. It took my breath away. There were little “hidden Mickeys” or “hidden princesses” everywhere. The faucets looked like lamps from Aladdin, and Carpet was on the carpet. There was a framed picture of Tiana that had been made by the Seven Dwarfs. Under the picture, was the footstool from “Beauty and the Beast.” There was a small shelf with hooks by the door decorated with the carriage from Cinderella. Ariel single-handedly owned the bathroom. The shower curtain was printed with dinglehoppers and snarfblats. It was a Disney fan’s room. Portraits of Snow White, Cinderella, Aurora, Ariel, Belle, Jasmine, Tiana and Rapunzel graced the wall. The headboards held a super-awesome secret surprise. I felt like I was staying in the Cinderella Castle Suite at the Magic Kingdom. We had to leave. We had things to do. We had to get to Animal Kingdom — or so Tom thought. As it turned out, there was a Martial Arts competition at the Wide World of Sports that same weekend. So, for my birthday, I took Tom to the competition. He totally geeked out. It was outstanding. I told him I wanted to get to AK the quickest way possible, so I’d do the GPS. I (thought I) turned the volume all the way down on my phone only to hear Siri say, “STARTING ROUTE TO ESPN WIDE WORLD OF SPORTS COMPLEX.” Crap. I just kept acting like I was directing Tom towards Animal Kingdom, and he obediently went straight when I told him to. Despite the big entrance that says, “ESPN WIDE WORLD OF SPORTS COMPLEX” he thought we were on the way to Animal Kingdom up until we turned into the parking lot. Tom’s expression was priceless. I think he said, “really? What? Really?” I was geeking out, too. It was nice to see him so happy. It was awesome to be able to surprise him. We took lots of pictures, and made it into the building where the competition was around 1, I think. Bruce was restless, so we went to the car and got his blanket. He fell asleep on the walk there, so I sat outside with him while Tom went inside the arena. It was a bummer to not be with him, but I know he likes to talk to coaches and stuff. I’m confident in his ability to fly solo at these things and what could we do? We had a tired kid. I wanted Bruce to be in a good mood at our special dinner. I texted Tom at 4 as a thunderstorm was rolling in. I was like, “let’s get out of here so we don’t get stuck.” We went to the room to get our ponchos and the rain stopped. But honestly, I’d rather take the time to get the poncho and it not rain than try to make a run for it with just enough time to make it to our reservation with no poncho and get soaked — because in that case, it would absolutely have rained on us. We got to Animal Kingdom at 5:10. Lindsay called. “Where are you guys?” Tom confidently said, “we are walking up to Animal Kingdom right now!” (Because we parked right at the entrance.) I don’t know how that conversation went, but she was outside the restaurant at Downtown Disney. I guess I never mentioned to her that we could only get reservations at the AK one. She made it by about 5:35. In honor of my 20th birthday dinner at Rainforest Cafe in Tyson’s Corner, at which Tom showed up and I fell in love, we took our little baby that we made and met Lindsay Kaye and had dinner celebrating my 30th. It was pricey, and the food was just okay. But holy crap, Bruce LOVED it. He LOVED watching all the animals and was situated so that he could watch the gorillas whenever they became animated. THAT was awesome. Never would have thought that in 10 years I’d have been back at Rainforest, with my husband and our son. After dinner, Tom went back to the competition for the grand finale and Lindsay and I took Bruce for a walk around the resort. It was so awesome. I felt bad about sending Tom alone, especially since we had a babysitter. But he came back just grinning ear to ear, wearing Lindsay’s Disney CM name tag, and talking about how much fun he had hanging out with the security guards. I had a lot more fun on my walk than I think I would’ve had at the competition. Riverside is pretty sweet for a Moderate Resort. It’ll be very tough to go back to a Value Resort after this. From 5:30 pm – 9:30 pm, they have horse-drawn carriage rides. The grounds are perfectly manicured, and lush. We walked along a path by the water as boats passed on their way to Downtown Disney. We went by the pool, it was big and nice and on an island, so I assume you could swim at all hours and not disturb anyone. (Although I hear that policy will be changing.) In the main building off the lobby, they have a singer/pianist in a bar. That place was packed! He was hilarious. It was just a really fun atmosphere. I can’t wait to go back. We all slept a lot later than I had planned. I had hoped to get to breakfast at some ungodly hour, because Tom kept talking about breakfast buffets. We all woke up around 10. We showered and decided to eat in Epcot. I had a creme brule (sp?) in France and a glass of Bordeaux. Tom and I split the Lucky Combo in China, which comes with a pork bun, curry chicken pastry thing, egg roll, strawberry red-bean ice cream and a Coke. $10. I think it’s the best deal at World Showcase. We walked all of World Showcase, all the countries, which was all I really wanted to do. As a bonus, we hit Journey into Imagination, and Living with the Land. Actually, the whole reason that I started writing this post was to tell you about Living with the Land. When we passed the farm house, you know, there’s that dog on the porch barking. Bruce barked back. It was SO COOL! He’s so smart. I love that little boy. Bruce was so cute the whole trip. He really looked around and watched stuff. We planned to leave at 4. We actually left Epcot around 4, but didn’t leave Disney until 7:24, according to Tom. It’s his own fault. Tom said that we should eat and then go. So, we went to Port Orleans. We’ve never had the Food Court there before, so that’d be something new and different. We walked by Boatwright’s, the table service restaurant at PO Riverside. They opened at 5, and it was about 4:50. We went to the food court, but Tom just kept talking about the other place. So, even though leaving sooner rather than later was for his benefit, he opted for Boatwright’s. It was GREAT! Bruce had cheesy-grits, one of his favorites. Lindsay had a chicken caesar salad. For a couple of dollars more, she could’ve had an amazing catfish instead of an alright salad. Next time. I had the catfish, Tom had crawfish. His was kind of like a stew over rice, Etouffe. Mine was crusted with something that was a tad spicy, but I weathered it. Considering the theme of the resort, everything was a bit on the spicy side. It came with that Disney corn bread that we all love. Tom and I both thought it was among the best food that we’ve had on property and just furthered the case for another stay in a Royal Room in the not too distant future. We found the trick to getting Bruce to stop screaming his head off after one late night lap around the block. My cousin Amy bought him a fleece poncho a long time ago. I thought it was too big for him, but oh my gosh he’s so stinkin’ cute in it. He wears it when we “wog” at night. It keeps Bruce warm, he can snuggle it, and best of all he can’t kick it off. Speaking of kicks, he’s wearing shoes routinely now. (Socks on the walks.) The jogging stroller has a plug for my iPod so that we can jog to music, and I think Bruce likes that, too. Bruce’s 1st Birthday invitations are all printed out. Lookin’ pretty sweet. The theme of the party is going to be Storybook Circus at Magic Kingdom. Kind of silly, I guess, because we could just take him to the actual Storybook Circus. I’m having a hard time finding THE BEST First Birthday Circus tableware. I bought a bunch of cheap prizes last night. I’m pretty excited about awarding tickets for prizes. Is that too carnival and not circus enough? The idea is to use that in lieu of goodie bags. Yesterday I had the aforementioned Simple and Fit Veggie Omelet, and homemade pizza, and actually I had a Snickers, too. However, I also had a spinach salad, and one and a half kale smoothies. Walked about 5 miles last night and woke up weighing 234.4. That’s a whole pound in one day! Aw yeeeeah. And we’re going to Disney World in a matter of hours. Aw yeeeeah! It’s a good day to be a La! I’m sure I won’t feel the same way every single day of his life, but for today: I have the sweetest most awesome little boy in the whole wide world. Just wanted you all to know. We returned to Once Upon A Child today. Remember them? Yeah. Well. I wrote one little email and whole world comes crashing down. They called Tom, because that’s the number they had. The corporate office emailed me. The store manager, Wendy, called me. We tried to call her back. Argh. It just wasn’t working out. We just weren’t getting in touch. My great uncle Hugh passed away, so we had to leave town for his funeral in Florida… It’s just been an intense few days! We touched base today. Tom called the store this afternoon. Store manager Wendy was there, so we decided to stop by the store on our way to the Summer Shootout at the Charlotte Motor Speedway. Maybe there’s something about people named Wendy, but she couldn’t have been sweeter. 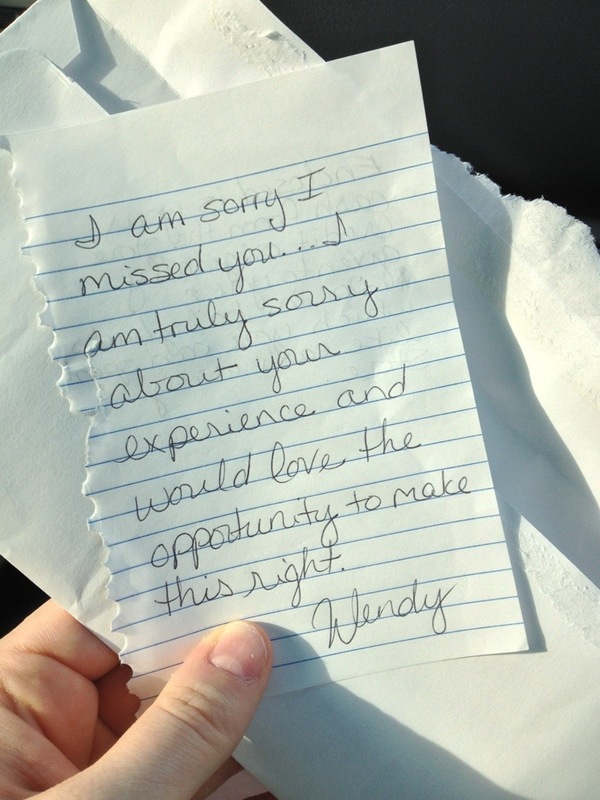 (I understand that my name is Wendy and I, in fact, wrote one less than sweet and very strongly worded letter, but generally I’m a nice gal, right?) She apologized profusely. I feel so bad. So bad. Our old box, the one we brought in, was waiting for us with a sealed envelope that had our cash and a note inside. I didn’t open it until we got out to the car. The store returned the items that were unacceptable for consignment and that had been donated. They also turned our store credit into cash. They ALSO gave us Baby Bucks that we can spend like cash in the store until 9/1. I’d be lying if I said that I wasn’t excited about that. Like I said in the beginning, I really wanted to love the place. THEY ALSO FIRED SOMEBODY OVER THE EMAIL THAT I WROTE. Yeah. Let’s just take a moment and let that one sink in. Because I thought the service was bad, someone is looking for a new job. I feel terrible about that. But I have to assume they know what they’re doing. I have to assume that they wouldn’t just take my word for it. Judge Judy sometimes asks litigants, “Does she look crazy to you? Mrs. So-and-So looks like a perfectly sane woman to me with fully functioning mental capacity…” What she is implying is that the person doing accusing isn’t crazy. They wouldn’t just fabricate that story for personal gain. No one’s going to key their own car just to get someone else in trouble for it unless they’re crazy. That was a lot of backstory, but my point is that I’m completely relatively sane! I feel HORRIBLE because someone was let go because of me, but a.) I don’t go around writing letters so that people lose their jobs and b.) it wasn’t because of me, really. It was because of them. Their behavior got them let go, not mine. Right? RIGHT?! I guess I could have bought my own outfits back with the Baby Bucks. Then it’d be like I was ahead of the game by $12.75. I’m excited about the prospect of new-to-you outfits for Bruce. I really want to love the place.